#define SC_LOG_DEF_LOG_FORMAT "[%i] %t - (%f:%l) <%d> (%n) -- "
Definition at line 539 of file util-debug.h. Referenced by AppLayerRegisterParser(), AppLayerRegisterProtocolDetection(), DecodeRegisterPerfCounters(), DetectAppLayerInspectEngineRegister(), DetectAppLayerInspectEngineRegister2(), DetectAppLayerMpmRegister2(), DetectParseRegexAddToFreeList(), DetectPcreRegister(), DetectSetupParseRegexes(), FlowDisableFlowManagerThread(), FlowDisableFlowRecyclerThread(), PostRunDeinit(), RuleMatchCandidateTxArrayFree(), RuleMatchCandidateTxArrayInit(), RunModeInitializeOutputs(), RunModeShutDown(), SCLogLoadConfig(), SCThresholdConfGlobalInit(), TmThreadCheckThreadState(), TmThreadDisablePacketThreads(), and TmThreadDisableReceiveThreads(). Fatal error IF we're starting up, and configured to consider errors to be fatal errors. Definition at line 547 of file util-debug.h. Definition at line 102 of file util-debug.h. Definition at line 86 of file util-debug.h. Definition at line 96 of file util-debug.h. Referenced by SCLogAllocLogOPBuffer(), and SCLogDeInitLogModule(). Definition at line 99 of file util-debug.h. Definition at line 106 of file util-debug.h. Referenced by SCLogAllocLogOPBuffer(), and SCLogLoadConfig(). Definition at line 105 of file util-debug.h. Definition at line 42 of file util-debug.h. Definition at line 41 of file util-debug.h. Definition at line 43 of file util-debug.h. ENV vars that can be used to set the properties for the logging module. Definition at line 39 of file util-debug.h. Definition at line 44 of file util-debug.h. Definition at line 40 of file util-debug.h. Definition at line 198 of file util-debug.h. Definition at line 200 of file util-debug.h. Definition at line 199 of file util-debug.h. Definition at line 197 of file util-debug.h. Definition at line 194 of file util-debug.h. Definition at line 203 of file util-debug.h. Definition at line 195 of file util-debug.h. Definition at line 193 of file util-debug.h. Definition at line 196 of file util-debug.h. Definition at line 93 of file util-debug.h. Definition at line 90 of file util-debug.h. Definition at line 337 of file util-debug.h. Referenced by AFPPeersListCheck(), AFPPeersListInit(), AppLayerDeSetup(), AppLayerDestroyCtxThread(), AppLayerGetCtxThread(), AppLayerGetProtoByName(), AppLayerGetProtoName(), AppLayerHandleTCPData(), AppLayerHandleUdp(), AppLayerHtpEnableRequestBodyCallback(), AppLayerHtpEnableResponseBodyCallback(), AppLayerHtpNeedFileInspection(), AppLayerListSupportedProtocols(), AppLayerParserBackupParserTable(), AppLayerParserConfParserEnabled(), AppLayerParserDeSetup(), AppLayerParserDestroyProtocolParserLocalStorage(), AppLayerParserGetDecoderEvents(), AppLayerParserGetEventInfo(), AppLayerParserGetEventsByTx(), AppLayerParserGetFiles(), AppLayerParserGetFirstDataDir(), AppLayerParserGetProtocolParserLocalStorage(), AppLayerParserGetStateProgress(), AppLayerParserGetStateProgressCompletionStatus(), AppLayerParserGetTransactionActive(), AppLayerParserGetTransactionInspectId(), AppLayerParserGetTransactionLogId(), AppLayerParserGetTx(), AppLayerParserGetTxCnt(), AppLayerParserGetTxDetectFlags(), AppLayerParserGetTxDetectState(), AppLayerParserGetTxLogged(), AppLayerParserHasDecoderEvents(), AppLayerParserParse(), AppLayerParserProtocolGetLoggerBits(), AppLayerParserProtocolHasLogger(), AppLayerParserProtocolIsTxAware(), AppLayerParserProtocolIsTxEventAware(), AppLayerParserProtocolSupportsTxs(), AppLayerParserRegisterDetectFlagsFuncs(), AppLayerParserRegisterDetectStateFuncs(), AppLayerParserRegisterGetEventInfo(), AppLayerParserRegisterGetEventsFunc(), AppLayerParserRegisterGetFilesFunc(), AppLayerParserRegisterGetStateProgressCompletionStatus(), AppLayerParserRegisterGetStateProgressFunc(), AppLayerParserRegisterGetTx(), AppLayerParserRegisterGetTxCnt(), AppLayerParserRegisterGetTxIterator(), AppLayerParserRegisterLocalStorageFunc(), AppLayerParserRegisterLogger(), AppLayerParserRegisterLoggerBits(), AppLayerParserRegisterLoggerFuncs(), AppLayerParserRegisterMpmIDsFuncs(), AppLayerParserRegisterOptionFlags(), AppLayerParserRegisterParser(), AppLayerParserRegisterParserAcceptableDataDirection(), AppLayerParserRegisterProtocolParsers(), AppLayerParserRegisterProtocolUnittests(), AppLayerParserRegisterStateFuncs(), AppLayerParserRegisterTruncateFunc(), AppLayerParserRegisterTxFreeFunc(), AppLayerParserRegisterUnittests(), AppLayerParserRestoreParserTable(), AppLayerParserSetEOF(), AppLayerParserSetStreamDepth(), AppLayerParserSetTransactionInspectId(), AppLayerParserSetTransactionLogId(), AppLayerParserSetTxDetectFlags(), AppLayerParserSetTxDetectState(), AppLayerParserSetTxLogged(), AppLayerParserSetup(), AppLayerParserStateAlloc(), AppLayerParserStateCleanup(), AppLayerParserStateFree(), AppLayerParserStateIssetFlag(), AppLayerParserStateSetFlag(), AppLayerParserStreamTruncated(), AppLayerParserThreadCtxAlloc(), AppLayerParserThreadCtxFree(), AppLayerParserTransactionsCleanup(), AppLayerParserTriggerRawStreamReassembly(), AppLayerProtoDetectConfProtoDetectionEnabled(), AppLayerProtoDetectDeSetup(), AppLayerProtoDetectDestroyCtxThread(), AppLayerProtoDetectGetCtxThread(), AppLayerProtoDetectGetProto(), AppLayerProtoDetectGetProtoByName(), AppLayerProtoDetectPMRegisterPatternCI(), AppLayerProtoDetectPMRegisterPatternCS(), AppLayerProtoDetectPMRegisterPatternCSwPP(), AppLayerProtoDetectPPParseConfPorts(), AppLayerProtoDetectPPRegister(), AppLayerProtoDetectPrepareState(), AppLayerProtoDetectRegisterProtocol(), AppLayerProtoDetectSetup(), AppLayerProtoDetectSupportedAppProtocols(), AppLayerProtoDetectSupportedIpprotos(), AppLayerProtoDetectUnittestCtxBackup(), AppLayerProtoDetectUnittestCtxRestore(), AppLayerProtoDetectUnittestsRegister(), AppLayerSetup(), AppLayerUnittestsRegister(), BasicSearch(), BoyerMooreCtxDeInit(), CleanupPcapFileFileVars(), ConfigCheckLogDirectory(), DCERPCInit(), DCERPCParser(), DecodeAFP(), DecodeAFPThreadInit(), DecodeErfDag(), DecodeErfDagThreadInit(), DecodeErfFile(), DecodeErfFileThreadInit(), DecodeIPFW(), DecodeIPV6FragHeader(), DecodePcap(), DecodePcapThreadInit(), DefragPolicyLoadFromConfig(), DetectAddressLookupInHead(), DetectAddressMatch(), DetectAddressMatchIPv4(), DetectAddressMatchIPv6(), DetectBytejumpDoMatch(), DetectBytetestDoMatch(), DetectCipServiceRegister(), DetectContentFree(), DetectDceIfaceRegister(), DetectDceOpnumRegister(), DetectDetectionFilterRegister(), DetectDsizeRegister(), DetectEngineContentInspection(), DetectEngineEventRegister(), DetectEngineInspectBufferGeneric(), DetectEngineInspectCIP(), DetectEngineInspectENIP(), DetectEngineInspectModbus(), DetectEngineInspectPacketPayload(), DetectEngineInspectStreamPayload(), DetectFileextRegister(), DetectFileInspectGeneric(), DetectFilemagicRegister(), DetectFilenameRegister(), DetectFilesizeRegister(), DetectFilestoreRegister(), DetectFlagsRegister(), DetectFlowMatch(), DetectFtpbounceRegister(), DetectHttpClientBodyRegister(), DetectHttpResponseLineRegister(), DetectHttpStatCodeRegister(), DetectHttpStatMsgRegister(), DetectHttpUriSetup(), DetectLuaRegister(), DetectMetadataFree(), DetectModbusRegister(), DetectNfsProcedureRegister(), DetectNfsVersionRegister(), DetectNocaseRegister(), DetectPcrePayloadMatch(), DetectPktDataRegister(), DetectPortHashLookup(), DetectPrefilterRegister(), DetectRawbytesRegister(), DetectReferenceFree(), DetectRpcFree(), DetectSshSoftwareVersionRegister(), DetectSshVersionRegister(), DetectSslVersionRegister(), DetectTlsRegister(), DetectTlsValidityRegister(), DetectTlsVersionRegister(), DetectTransformCompressWhitespaceRegister(), DetectTransformMd5Register(), DetectTransformSha1Register(), DetectTransformSha256Register(), DetectTransformStripWhitespaceRegister(), DetectUricontentRegister(), DetectUrilenRegister(), EngineAnalysisRulesFailure(), FileAppendData(), FileAppendDataById(), FileAppendGAPById(), FileCloseFile(), FileCloseFileById(), FileCloseFilePtr(), FileContainerSetTx(), FileDisableFilesize(), FileDisableMagic(), FileDisableMd5(), FileDisableSha1(), FileDisableSha256(), FileDisableStoring(), FileDisableStoringForTransaction(), FileOpenFile(), FileSetRange(), FileStoreAllFiles(), FileStoreAllFilesForTx(), FileStoreFileById(), FileTrackedSize(), FileTruncateAllOpenFiles(), FlowClearMemory(), FlowInit(), FlowUpdateSpareFlows(), FTPMemcapGlobalCounter(), HTPAtExitPrintStats(), HtpBodyAppendChunk(), HtpBodyFree(), HtpBodyPrint(), HtpBodyPrune(), HTPConfigure(), HTPFileClose(), HTPFileSetRange(), HTPFileStoreChunk(), HTPFreeConfig(), HTPStateFree(), IPFWSetVerdict(), IPOnlyCIDRListFree(), JsonDNSLogAnswer(), LiveDeviceListClean(), LogHttpLogger(), LogTcpDataLogger(), NapatechDecode(), NapatechDecodeThreadInit(), NapatechStreamThreadDeinit(), NapatechStreamThreadInit(), NoNFLOGSupportExit(), NoWinDivertSupportExit(), PacketAlertFinalize(), PacketAlertGetTag(), PacketAlertThreshold(), PacketCreateMask(), PacketDefragPktSetup(), PacketTunnelPktSetup(), PcapDirectoryDispatch(), PcapFileDispatch(), PcapFileGlobalInit(), PmqSetup(), PoolGet(), PoolReturn(), PostRunDeinit(), Prefilter(), PrefilterGenericMpmRegister(), PrefilterPktStreamRegister(), printUUID(), ReceiveAFPLoop(), ReceiveAFPThreadExitStats(), ReceiveAFPThreadInit(), ReceiveErfDagLoop(), ReceiveErfDagThreadDeinit(), ReceiveErfDagThreadInit(), ReceiveErfFileLoop(), ReceiveErfFileThreadInit(), ReceiveIPFWLoop(), ReceiveIPFWThreadDeinit(), ReceiveIPFWThreadExitStats(), ReceiveIPFWThreadInit(), ReceiveNFQLoop(), ReceivePcapBreakLoop(), ReceivePcapLoop(), ReceivePcapThreadExitStats(), ReceivePcapThreadInit(), ReceivePfringLoop(), RegisterAllModules(), RegisterDNP3Parsers(), RegisterENIPTCPParsers(), RegisterENIPUDPParsers(), RegisterHTPParsers(), RegisterModbusParsers(), RejectSendIPv4ICMP(), RejectSendIPv4TCP(), RejectSendIPv6ICMP(), RejectSendIPv6TCP(), RunModeErfFileAutoFp(), RunModeErfFileSingle(), RunModeFilePcapAutoFp(), RunModeIdsAFPAutoFp(), RunModeIdsAFPSingle(), RunModeIdsAFPWorkers(), RunModeIdsErfDagAutoFp(), RunModeIdsErfDagSingle(), RunModeIdsErfDagWorkers(), RunModeIdsNetmapAutoFp(), RunModeIdsNetmapSingle(), RunModeIdsNetmapWorkers(), RunModeIdsNflogAutoFp(), RunModeIdsNflogSingle(), RunModeIdsNflogWorkers(), RunModeIdsPcapAutoFp(), RunModeIdsPcapSingle(), RunModeIdsPcapWorkers(), RunModeIdsPfringAutoFp(), RunModeIdsPfringSingle(), RunModeIdsPfringWorkers(), RunModeIpsIPFWAutoFp(), RunModeIpsIPFWWorker(), RunModeIpsNFQAutoFp(), RunModeIpsNFQWorker(), RunModeIpsWinDivertAutoFp(), RunModeSetIPSAutoFp(), SCPidfileCreate(), SCRuleVarsGetConfVar(), SigAddressPrepareStage4(), SigAlloc(), SigGroupHeadContainsSigId(), SigGroupHeadHashLookup(), SigGroupHeadPrintSigs(), SigInit(), SigLoadSignatures(), SigMatchList2DataArray(), SigMatchListSMBelongsTo(), SigMatchSignaturesGetSgh(), SignatureHasPacketContent(), SignatureHasStreamContent(), SigParseApplyDsizeToContent(), SMTPProcessDataChunk(), StatsSetUI64(), StatsSpawnThreads(), StreamReassembleLog(), StreamReassembleRawUpdateProgress(), StreamTcpInlineSegmentCompare(), StreamTcpInlineSegmentReplacePacket(), StreamTcpPacket(), StreamTcpPruneSession(), StreamTcpPseudoPacketCreateStreamEndPacket(), StreamTcpPseudoSetup(), StreamTcpReassembleAppLayer(), StreamTcpReassembleDepthReached(), StreamTcpReassembleFreeThreadCtx(), StreamTcpReassembleHandleSegment(), StreamTcpReassembleHandleSegmentHandleData(), StreamTcpReassembleInitThreadCtx(), StreamTcpReassembleInsertSegment(), StreamTcpSackFreeList(), StreamTcpSackPruneList(), StreamTcpSessionCleanup(), StreamTcpSessionClear(), StreamTcpSessionPktFree(), StreamTcpThreadDeinit(), StreamTcpThreadInit(), TagHandlePacket(), TagHashAddTag(), ThresholdIPPairTimeoutCheck(), TmModuleDecodeNetmapRegister(), TmModuleDecodePcapRegister(), TmqhOutputPacketpool(), TmThreadSetPrio(), UTHPacketMatchSigMpm(), VerdictIPFW(), VerdictIPFWThreadDeinit(), and VerdictIPFWThreadInit(). Holds the global log level. Is the same as sc_log_config->log_level. Adds the global log_format to the outgoing buffer. Definition at line 211 of file util-debug.h. Macro used to log ALERT messages. Definition at line 317 of file util-debug.h. Definition at line 259 of file util-debug.h. Definition at line 307 of file util-debug.h. Definition at line 335 of file util-debug.h. Referenced by ActionInitConfig(), AddressDebugPrint(), AffinityGetNextCPU(), AffinitySetupLoadFromConfig(), AFPIsFanoutSupported(), AFPSetBPFFilter(), AlertFastLogInitCtx(), AlertFastLogThreadInit(), AppLayerExpectationHandle(), AppLayerHandleTCPData(), AppLayerHandleUdp(), AppLayerHtpPrintStats(), AppLayerIncTxCounter(), AppLayerParserConfParserEnabled(), AppLayerParserDestroyProtocolParserLocalStorage(), AppLayerParserParse(), AppLayerParserSetTransactionInspectId(), AppLayerParserStreamTruncated(), AppLayerParserTransactionsCleanup(), AppLayerParserTriggerRawStreamReassembly(), AppLayerProtoDetectConfProtoDetectionEnabled(), AppLayerProtoDetectGetProto(), AppLayerProtoDetectPPParseConfPorts(), AppLayerRegisterParser(), AppLayerRegisterProtocolDetection(), BasicSearch(), ByteExtractString(), ByteExtractStringUint16(), ByteExtractStringUint32(), ByteExtractStringUint8(), CheckValidDaemonModes(), CleanupPcapFileFileVars(), ConfDeInit(), ConfGet(), ConfGetChildValue(), ConfGetValue(), ConfInit(), ConfLoadCompleteIncludePath(), CoredumpLoadConfig(), CreateGroupedPortList(), CreateGroupedPortListCmpCnt(), Daemonize(), DCERPCParser(), DecodeBase64(), DecodeCIPPDU(), DecodeCIPRequestMSPPDU(), DecodeCIPRequestPathPDU(), DecodeCIPRequestPDU(), DecodeCIPResponseMSPPDU(), DecodeCIPResponsePDU(), DecodeCommonPacketFormatPDU(), DecodeENIPPDU(), DecodeERSPAN(), DecodeEthernet(), DecodeGRE(), DecodeICMPV4(), DecodeICMPV6(), DecodeIPFW(), DecodeIPV4(), DecodeIPV6(), DecodeIPV6FragHeader(), DecodeNFQ(), DecodeNull(), DecodePPP(), DecodePPPOEDiscovery(), DecodePPPOESession(), DecodeRaw(), DecodeSCTP(), DecodeSll(), DecodeTCP(), DecodeThreadVarsAlloc(), DecodeTunnel(), DecodeUDP(), DecodeVLAN(), DefragInitConfig(), DefragPolicyGetHostTimeout(), DefragPolicyLoadFromConfig(), DefragRbFragCompare(), DefragSetDefaultTimeout(), DefragTrackerFreeFrags(), Detect(), DetectAckRegister(), DetectAddressAdd(), DetectAddressCmpIPv4(), DetectAddressCmpIPv6(), DetectAddressCutIPv4(), DetectAddressInsert(), DetectAddressLookupInHead(), DetectAddressMatch(), DetectAddressMergeNot(), DetectAddressParse(), DetectAddressParseString(), DetectAddressPrint(), DetectAddressTestConfVars(), DetectAppLayerInspectEngineRegister2(), DetectAppLayerMpmRegister(), DetectAppLayerMpmRegister2(), DetectAppLayerMpmRegisterByParentId(), DetectBase64DecodeDoMatch(), DetectBufferGetActiveList(), DetectBufferTypeGetByIdTransforms(), DetectBufferTypeMaxId(), DetectBufferTypeSupportsMpm(), DetectBufferTypeSupportsMpmGetById(), DetectBufferTypeSupportsPacket(), DetectBufferTypeSupportsPacketGetById(), DetectBufferTypeSupportsTransformations(), DetectByteExtractDoMatch(), DetectBytejumpDoMatch(), DetectBytetestDoMatch(), DetectCipServiceRegister(), DetectContentDataParse(), DetectContentPrint(), DetectContentPropagateLimits(), DetectDceIfaceRegister(), DetectDceOpnumRegister(), DetectDceStubDataRegister(), DetectDsizeRegister(), DetectEngineAddToMaster(), DetectEngineAppInspectionEngine2Signature(), DetectEngineBumpVersion(), DetectEngineContentInspection(), DetectEngineCtxFree(), DetectEngineEventRegister(), DetectEngineGetCurrent(), DetectEngineInspectBufferGeneric(), DetectEngineInspectCIP(), DetectEngineInspectENIP(), DetectEngineInspectGenericList(), DetectEngineInspectModbus(), DetectEngineInspectStream(), DetectEngineMoveToFreeList(), DetectEngineMTApply(), DetectEngineMultiTenantEnabled(), DetectEngineMultiTenantSetup(), DetectEnginePruneFreeList(), DetectEngineReload(), DetectEngineResetMaxSigId(), DetectEngineStateFree(), DetectEngineStateResetTxs(), DetectEngineThreadCtxInit(), DetectFileextRegister(), DetectFileInspectGeneric(), DetectFilemagicRegister(), DetectFileMd5Register(), DetectFilenameRegister(), DetectFileSha1Register(), DetectFileSha256Register(), DetectFilesizeRegister(), DetectFilestoreRegister(), DetectFlagsRegister(), DetectFlagsSignatureNeedsSynOnlyPackets(), DetectFlowbitMatch(), DetectFlowbitsAnalyze(), DetectFlowintFree(), DetectFlowintMatch(), DetectFlowMatch(), DetectFlowSetupImplicit(), DetectFlowvarMatch(), DetectFlowvarPostMatchSetup(), DetectFragOffsetFree(), DetectFragOffsetRegister(), DetectFtpbounceRegister(), DetectFtpdataRegister(), DetectGeoipRegister(), DetectHttpClientBodyRegister(), DetectHttpCookieRegister(), DetectHttpHeaderNamesRegister(), DetectHttpMethodRegister(), DetectHttpStartRegister(), DetectHttpUARegister(), DetectHttpUriSetup(), DetectIcmpIdFree(), DetectIcmpIdRegister(), DetectIcmpSeqFree(), DetectIcmpSeqRegister(), DetectICodeFree(), DetectIdFree(), DetectIdRegister(), DetectIPRepFree(), DetectIPRepRegister(), DetectIsdataatSetup(), DetectITypeFree(), DetectL3ProtoRegister(), DetectLoadCompleteSigPath(), DetectLoaderQueueTask(), DetectLoadersSync(), DetectLuaRegister(), DetectMarkRegister(), DetectMetadataHashFree(), DetectMpmInitializeAppMpms(), DetectMpmSetupAppMpms(), DetectMsgRegister(), DetectNfsProcedureRegister(), DetectNfsVersionRegister(), DetectOffsetRegister(), DetectParseAddress(), DetectPcrePayloadMatch(), DetectPcreRegister(), DetectPktvarRegister(), DetectPortHashFree(), DetectPortInsert(), DetectPortIsValidRange(), DetectPortListsAreEqual(), DetectPortParse(), DetectPortPrint(), DetectPortPrintList(), DetectPortTestConfVars(), DetectProtoContainsProto(), DetectProtoParse(), DetectReferenceFree(), DetectReplaceAddToList(), DetectReplaceExecuteInternal(), DetectReplaceFreeInternal(), DetectRpcFree(), DetectRpcRegister(), DetectRunPrefilterTx(), DetectRunStoreStateTx(), DetectSeqRegister(), DetectSetupParseRegexes(), DetectSignatureApplyActions(), DetectSshSoftwareVersionRegister(), DetectSshVersionRegister(), DetectSslStateRegister(), DetectSslVersionRegister(), DetectStreamSizeRegister(), DetectTagRegister(), DetectTemplate2Free(), DetectTemplate2Register(), DetectTemplateRegister(), DetectTlsRegister(), DetectTlsValidityRegister(), DetectTlsVersionRegister(), DetectTosRegister(), DetectTtlFree(), DetectTtlRegister(), DetectUricontentRegister(), DetectUrilenApplyToContent(), DetectUrilenRegister(), DetectUrilenValidateContent(), DetectXbitMatchHost(), DetectXbitsRegister(), DNSCreateRcodeString(), FileAppendGAPById(), FileCloseFilePtr(), FileContainerSetTx(), FileDataSize(), FileDisableFilesize(), FileDisableMagic(), FileDisableMd5(), FileDisableSha1(), FileDisableSha256(), FileDisableStoring(), FileDisableStoringForTransaction(), FileOpenFile(), FilePrune(), FileSetTx(), FileTrackedSize(), FlowGetFlowFromHash(), FlowHandlePacketUpdate(), FlowInit(), FlowInitConfig(), FlowVarPrint(), FTPAtExitPrintStats(), GenericVarFree(), GetAffinityTypeFromName(), GetIfaceMaxPacketSize(), HashListTableAdd(), HashListTableLookup(), HashListTableRemove(), HostGetActiveCount(), HostInitConfig(), HTPAtExitPrintStats(), HtpBodyAppendChunk(), HtpBodyFree(), HtpBodyPrint(), HtpBodyPrune(), HtpConfigRestoreBackup(), HTPConfigure(), HTPFileClose(), HTPFileOpen(), HTPFileSetRange(), HTPFileStoreChunk(), HTPFreeConfig(), HTPStateFree(), HttpHeaderExpandBuffer(), HttpHeaderThreadDataFree(), HttpXFFGetIP(), HttpXFFGetIPFromTx(), InitPcapFile(), InspectionBufferApplyTransforms(), InspectionBufferMultipleForListGet(), IPFWRegisterQueue(), IPFWSetVerdict(), IPOnlyCIDRListFree(), IPOnlyMatchPacket(), IPOnlyPrepare(), IPOnlySigParseAddress(), IPPairGetActiveCount(), IPPairInitConfig(), IPv4AddressStringIsValid(), IPv6AddressStringIsValid(), LiveDeviceFinalize(), LiveRegisterDevice(), LiveRegisterDeviceName(), LogCustomFormatAddNode(), LogFilestoreRegister(), LogHttpLogInitCtx(), LogHttpLogThreadInit(), LogStatsLogThreadDeinit(), LogStatsLogThreadInit(), LogTcpDataLogInitCtx(), LogTcpDataLogThreadInit(), LogTlsStoreRegister(), MemBufferExpand(), MimeDecAddEntity(), MimeDecDeInitParser(), MimeDecParseComplete(), MimeDecParseFullMsg(), MimeDecParseLine(), MimeDecParseStateGetStatus(), MpmAddPattern(), MpmStoreFree(), MpmStorePrepareBuffer(), MpmStoreReportStats(), NapatechGetStreamConfig(), NapatechPacketLoopZC(), NapatechStreamThreadDeinit(), NapatechStreamThreadInit(), NFQInitConfig(), NFQRegisterQueue(), NoNFLOGSupportExit(), NoWinDivertSupportExit(), OutputFlowLog(), OutputFlowLogThreadInit(), OutputJsonRegister(), OutputRegisterFiledataLogger(), OutputRegisterFiledataModule(), OutputRegisterFiledataSubModule(), OutputRegisterFileLogger(), OutputRegisterFileModule(), OutputRegisterFileSubModule(), OutputRegisterFlowLogger(), OutputRegisterFlowModule(), OutputRegisterFlowSubModule(), OutputRegisterPacketLogger(), OutputRegisterPacketModule(), OutputRegisterPacketSubModule(), OutputRegisterStatsLogger(), OutputRegisterStatsModule(), OutputRegisterStatsSubModule(), OutputRegisterStreamingLogger(), OutputRegisterStreamingModule(), OutputRegisterStreamingSubModule(), OutputRegisterTxLogger(), OutputStatsLog(), PacketAlertAppend(), PacketAlertFinalize(), PacketAlertGetTag(), PacketAlertRemove(), PacketCreateMask(), PacketGetFromAlloc(), PacketPoolInit(), PacketPoolPostRunmodes(), PacketTunnelPktSetup(), PatternMatchDestroy(), PatternMatchPrepareGroup(), PatternMatchThreadDestroy(), PatternMatchThreadPrepare(), PatternMatchThreadPrint(), PcapDetermineDirectoryOrFile(), PcapDirectoryDispatch(), PcapFileGlobalInit(), PoolGet(), PoolPrintSaturation(), PoolReturn(), PoolThreadGrow(), PoolThreadInit(), PoolThreadReturn(), PostRunDeinit(), PrefilterInit(), PrefilterSetupRuleGroup(), printUUID(), ReceiveAFPLoop(), ReceiveErfDagLoop(), ReceiveIPFWLoop(), ReceiveNFQThreadInit(), RegisterENIPTCPParsers(), RegisterENIPUDPParsers(), RegisterNFSTCPParsers(), RegisterNFSUDPParsers(), RegisterSSHParsers(), RegisterSSLParsers(), RegisterTFTPParsers(), RetrieveFPForSig(), RuleMatchCandidateTxArrayFree(), RuleMatchCandidateTxArrayInit(), RunmodeAutoFpCreatePickupQueuesString(), RunModeErfFileAutoFp(), RunModeFilePcapAutoFp(), RunModeIdsAFPAutoFp(), RunModeIdsAFPRegister(), RunModeIdsAFPSingle(), RunModeIdsAFPWorkers(), RunModeIdsNetmapAutoFp(), RunModeIdsNetmapSingle(), RunModeIdsNetmapWorkers(), RunModeIdsPcapRegister(), RunModeIdsPfringRegister(), RunModeInitialize(), RunModeInitializeOutputs(), RunModeNapatechRegister(), RunModeRegisterNewRunMode(), RunModeSetIPSAutoFp(), RunModeSetLiveCaptureAutoFp(), RunModeShutDown(), SBB_RB_FIND_INCLUSIVE(), SBBCompare(), SCACBSPreparePatterns(), SCACPreparePatterns(), SCACTilePreparePatterns(), SCAsn1Decode(), SCAsn1LoadConfig(), SCClassConfClasstypeHashCompareFunc(), SCClassConfDeInitContext(), SCClassConfGenerateInValidDummyClassConfigFD02(), SCClassConfGenerateInValidDummyClassConfigFD03(), SCClassConfGenerateValidDummyClassConfigFD01(), SCClassConfInit(), SCConfLogReopen(), SCKernelVersionIsAtLeast(), SCLogLoadConfig(), SCMapEnumNameToValue(), SCMapEnumValueToName(), SCProfilingKeywordsGlobalInit(), SCProfilingPrefilterGlobalInit(), SCProfilingPrefilterInitCounters(), SCProfilingSghsGlobalInit(), SCRadixAddKeyIPV6String(), SCRadixReleaseRadixTree(), SCRConfDeInitContext(), SCRConfGenerateInValidDummyReferenceConfigFD02(), SCRConfGenerateInValidDummyReferenceConfigFD03(), SCRConfGenerateValidDummyReferenceConfigFD01(), SCRConfReferenceHashCompareFunc(), SCReferenceConfInit(), SCRuleVarsGetConfVar(), SCSigOrderSignatures(), SCSigRegisterSignatureOrderingFuncs(), SCThresholdConfInitContext(), SCThresholdConfParseFile(), SigAddressCleanupStage1(), SigAddressPrepareStage1(), SigAddressPrepareStage2(), SigAddressPrepareStage4(), SigAlloc(), SigGroupHeadFree(), SigGroupHeadPrintSigs(), SigGroupHeadSetFileHashFlag(), SigGroupHeadSetProtoAndDirection(), SigMatchList2DataArray(), SigMatchListSMBelongsTo(), SigMatchSignaturesGetSgh(), SignatureHasPacketContent(), SignatureHasStreamContent(), SignatureIsIPOnly(), SigParseApplyDsizeToContent(), SigParseSetDsizePair(), SigTableRegisterTests(), SMTPProcessDataChunk(), SMTPStateAlloc(), SRepHostTimedOut(), SRepInit(), SRepLoadCatFileFromFD(), SRepLoadFileFromFD(), SRepReloadComplete(), SRepResetVersion(), SSLSetEvent(), SSLVersionToString(), StatsSetUI64(), StatsUpdateCounterArray(), StorageAllocById(), StorageAllocByIdPrealloc(), StorageFinalize(), StorageFreeById(), StorageGetById(), StorageSetById(), StreamingBufferClear(), StreamingBufferCompareRawData(), StreamingBufferFree(), StreamingBufferInsertAt(), StreamingBufferSlide(), StreamingBufferSlideToOffset(), StreamNeedsReassembly(), StreamReassembleRawUpdateProgress(), StreamTcp(), StreamTcpDecrMemuse(), StreamTcpFreeConfig(), StreamTcpGetSegment(), StreamTcpIncrMemuse(), StreamTcpInitConfig(), StreamTcpInlineSegmentCompare(), StreamTcpInlineSegmentReplacePacket(), StreamTcpPacket(), StreamTcpPruneSession(), StreamTcpPseudoPacketCreateStreamEndPacket(), StreamTcpReassembleAppLayer(), StreamTcpReassembleDecrMemuse(), StreamTcpReassembleDepthReached(), StreamTcpReassembleGetMemcap(), StreamTcpReassembleHandleSegment(), StreamTcpReassembleHandleSegmentHandleData(), StreamTcpReassembleIncrMemuse(), StreamTcpReassembleInitThreadCtx(), StreamTcpReassembleInsertSegment(), StreamTcpReassembleTriggerRawReassembly(), StreamTcpReassemblySetMinInspectDepth(), StreamTcpSackPruneList(), StreamTcpSackUpdatePacket(), StreamTcpSegmentForEach(), StreamTcpSetOSPolicy(), StreamTcpThreadDeinit(), StreamTcpThreadInit(), SupportFastPatternForSigMatchList(), TagFlowAdd(), TagHashAddTag(), TagTimeoutCheck(), TAILQ_HEAD(), TcpSackCompare(), TcpSegmentCompare(), ThresholdIPPairTimeoutCheck(), TimeGet(), TimeModeSetLive(), TimeModeSetOffline(), TimeSet(), TLSGetIPInformations(), TmModuleBypassedFlowManagerRegister(), TmModuleDebugList(), TmModuleDecodeAFPRegister(), TmModuleDecodeNetmapRegister(), TmModuleDecodePcapRegister(), TmModuleDecodePfringRegister(), TmModuleDetectLoaderRegister(), TmModuleFlowManagerRegister(), TmModuleFlowRecyclerRegister(), TmqCreateQueue(), TmqhOutputFlowSetupCtx(), TmqhOutputPacketpool(), TmqhOutputSimple(), TmreadsGetMinimalTimestamp(), TmSlotGetSlotForTM(), TmThreadCreate(), TmThreadDisablePacketThreads(), TmThreadDisableReceiveThreads(), TmThreadKillThreads(), TmThreadRemove(), TmThreadSetPrio(), TmThreadsSlotVarRun(), Unified2AlertThreadInit(), UnixSocketPcapFile(), UtilCpuGetNumProcessorsConfigured(), UtilCpuGetNumProcessorsMax(), UtilCpuGetNumProcessorsOnline(), UtilCpuPrintSummary(), VarNameStoreFree(), VarNameStoreFreeOld(), VarNameStoreLookupByName(), VarNameStoreSetupStaging(), VerdictIPFW(), and VerdictNFQ(). Macro used to log EMERGENCY messages. Definition at line 327 of file util-debug.h. Definition at line 230 of file util-debug.h. Definition at line 294 of file util-debug.h. Referenced by ActionInitConfig(), AffinityGetNextCPU(), AffinitySetupLoadFromConfig(), AFPGetLinkType(), AFPIsFanoutSupported(), AFPPeersListCheck(), AFPRunModeIsIPS(), AFPSetBPFFilter(), AppLayerGetPktEventInfo(), AppLayerHtpPrintStats(), AppLayerParserConfParserEnabled(), AppLayerProtoDetectConfProtoDetectionEnabled(), AppLayerProtoDetectPPParseConfPorts(), AppLayerProtoDetectSetup(), AppLayerRegisterExpectationProto(), BoyerMooreCtxInit(), BuildCpusetWithCallback(), ByteExtractStringInt16(), ByteExtractStringInt32(), ByteExtractStringInt8(), ByteExtractStringSigned(), CheckValidDaemonModes(), CleanupPcapFileDirectoryVars(), ConfGetChildValueInt(), ConfGetInt(), ConfGetNode(), ConfGetValue(), ConfInit(), ConfUnixSocketIsEnable(), ConfYamlLoadFile(), ConfYamlLoadFileWithPrefix(), CoredumpLoadConfig(), Daemonize(), DecodeAFP(), DecodeErfDag(), DecodePcap(), DecodeThreadVarsAlloc(), DefragInit(), DefragInitConfig(), DefragPolicyGetHostTimeout(), DefragPolicyLoadFromConfig(), DefragTrackerFreeFrags(), DefragTrackerQueueNew(), DetectAddressMergeNot(), DetectAddressParseString(), DetectAddressTestConfVars(), DetectAppLayerEventRegister(), DetectAppLayerInspectEngineRegister(), DetectAppLayerInspectEngineRegister2(), DetectAsn1Register(), DetectBase64DataRegister(), DetectBase64DecodeDoMatch(), DetectBufferTypeGetByIdTransforms(), DetectBypassRegister(), DetectByteExtractDoMatch(), DetectBytejumpDoMatch(), DetectBytetestDoMatch(), DetectCipServiceRegister(), DetectClasstypeRegister(), DetectContentDataParse(), DetectContentPMATCHValidateCallback(), DetectDceIfaceRegister(), DetectDceOpnumRegister(), DetectDepthRegister(), DetectDetectionFilterRegister(), DetectDistanceRegister(), DetectDsizeRegister(), DetectEngineAppendSig(), DetectEngineContentModifierBufferSetup(), DetectEngineCtxFree(), DetectEngineEventRegister(), DetectEngineGetEventInfo(), DetectEngineInspectBufferGeneric(), DetectEngineMultiTenantEnabled(), DetectEngineMultiTenantSetup(), DetectEngineReload(), DetectEngineReloadTenantBlocking(), DetectEngineResetMaxSigId(), DetectEnipCommandRegister(), DetectFastPatternRegister(), DetectFilemagicRegister(), DetectFilesizeRegister(), DetectFilestoreRegister(), DetectFlagsRegister(), DetectFlowbitMatch(), DetectFlowintMatch(), DetectFlowMatch(), DetectFlowSetupImplicit(), DetectFlowvarMatch(), DetectFragBitsRegister(), DetectFragOffsetRegister(), DetectFtpdataRegister(), DetectGeoipRegister(), DetectGidRegister(), DetectHttpMethodRegister(), DetectHttpRawHeaderRegister(), DetectIcmpIdRegister(), DetectIcmpSeqRegister(), DetectIdRegister(), DetectIPProtoRegister(), DetectIPRepRegister(), DetectIsdataatFree(), DetectIsdataatRegister(), DetectIsdataatSetup(), DetectL3ProtoRegister(), DetectLoadCompleteSigPath(), DetectLoadersInit(), DetectLoadersSync(), DetectLuaRegister(), DetectMarkRegister(), DetectMetadataHashFree(), DetectMsgRegister(), DetectNfsProcedureRegister(), DetectNfsVersionRegister(), DetectNoalertRegister(), DetectNocaseRegister(), DetectOffsetRegister(), DetectPcrePayloadMatch(), DetectPktDataRegister(), DetectPktvarRegister(), DetectPortListsAreEqual(), DetectPortTestConfVars(), DetectPrefilterRegister(), DetectPriorityRegister(), DetectRawbytesRegister(), DetectReferenceFree(), DetectReplaceRegister(), DetectRevRegister(), DetectRpcRegister(), DetectSidRegister(), DetectSignatureAddTransform(), DetectSignatureSetAppProto(), DetectSshSoftwareVersionRegister(), DetectSshVersionRegister(), DetectSslStateRegister(), DetectSslVersionRegister(), DetectStreamSizeRegister(), DetectTagRegister(), DetectTargetRegister(), DetectTemplate2Register(), DetectTemplateRegister(), DetectThresholdRegister(), DetectTlsRegister(), DetectTlsValidityRegister(), DetectTlsVersionRegister(), DetectTosRegister(), DetectTransformMd5Register(), DetectTransformSha1Register(), DetectTransformSha256Register(), DetectTtlRegister(), DetectUricontentRegister(), DetectUrilenRegister(), DetectUrilenValidateContent(), DetectWindowRegister(), DetectWithinRegister(), DetectXbitMatchHost(), DetectXbitsRegister(), DNSStateGetEventInfo(), EngineAnalysisFP(), EngineAnalysisRulesFailure(), EngineDone(), FileContainerAlloc(), FileContainerFree(), FlowInitConfig(), FlowManagerThreadSpawn(), FlowQueueNew(), FlowRecyclerThreadSpawn(), GetIfaceMaxPacketSize(), HostBitInitCtx(), HostInitConfig(), HostQueueNew(), HTPConfigure(), HTPFreeConfig(), HTPParseMemcap(), InitPcapFile(), IPFWRegisterQueue(), IPOnlyCIDRListFree(), IPOnlyInit(), IPOnlyPrepare(), IPOnlySigParseAddress(), IPPairBitInitCtx(), IPPairInitConfig(), IPPairQueueNew(), Ja3BufferAddValue(), Ja3BufferAppendBuffer(), Ja3BufferFree(), Ja3GenerateHash(), LogCustomFormatAlloc(), LogCustomFormatNodeAlloc(), LogHttpLogInitCtx(), LogStatsLogThreadDeinit(), LogTcpDataLogInitCtx(), main(), MimeDecAddEntity(), MimeDecAddField(), MimeDecFindField(), MimeDecInitParser(), MpmACBSRegister(), MpmFactoryGetMpmCtxForProfile(), MpmFactoryRegisterMpmCtxProfile(), NapatechDecode(), NapatechGetStreamConfig(), NapatechPacketLoopZC(), NapatechSetupTraffic(), NapatechStartStats(), NapatechStreamThreadInit(), NFQInitConfig(), NFQParseAndRegisterQueues(), NFQRegisterQueue(), NoNFLOGSupportExit(), NoWinDivertSupportExit(), OutputJsonRegister(), OutputRegisterFiledataLogger(), OutputRegisterFiledataModule(), OutputRegisterFiledataSubModule(), OutputRegisterFileModule(), OutputRegisterFileRotationFlag(), OutputRegisterFileSubModule(), OutputRegisterFlowModule(), OutputRegisterFlowSubModule(), OutputRegisterPacketModule(), OutputRegisterPacketSubModule(), OutputRegisterStatsModule(), OutputRegisterStatsSubModule(), OutputRegisterStreamingModule(), OutputRegisterStreamingSubModule(), OutputRegisterTxLogger(), PacketPoolInit(), ParseSizeDeinit(), ParseSizeInit(), PatternMatchDefaultMatcher(), PcapDetermineDirectoryOrFile(), PcapDirectoryDispatch(), PcapFileDispatch(), PcapFileGlobalInit(), PcapLogProfileSetup(), PerCentEncodingMatch(), PerCentEncodingSetup(), PoolInit(), PoolThreadGrow(), PostRunDeinit(), PrefilterAddSidsResize(), PrintInet(), ReceiveAFPLoop(), ReceiveAFPThreadInit(), ReceiveErfDagLoop(), ReceiveErfDagThreadInit(), ReceiveErfFileLoop(), ReceiveErfFileThreadInit(), ReceiveIPFWThreadInit(), ReceiveNFQThreadInit(), ReceivePcapLoop(), ReceivePcapThreadExitStats(), ReceivePcapThreadInit(), ReceivePfringLoop(), ReceivePfringThreadInit(), RegisterAllModules(), RegisterModbusParsers(), RegisterSMBParsers(), RejectSendLibnet11L3IPv4ICMP(), RejectSendLibnet11L3IPv4TCP(), RejectSendLibnet11L3IPv6ICMP(), RejectSendLibnet11L3IPv6TCP(), ROHashInit(), ROHashInitFinalize(), ROHashInitQueueValue(), RunmodeAutoFpCreatePickupQueuesString(), RunModeDispatch(), RunModeErfFileAutoFp(), RunModeErfFileSingle(), RunModeFilePcapAutoFp(), RunModeFilePcapSingle(), RunModeIdsAFPAutoFp(), RunModeIdsAFPRegister(), RunModeIdsAFPSingle(), RunModeIdsAFPWorkers(), RunModeIdsErfDagAutoFp(), RunModeIdsErfDagSingle(), RunModeIdsErfDagWorkers(), RunModeIdsNetmapAutoFp(), RunModeIdsNetmapRegister(), RunModeIdsNetmapSingle(), RunModeIdsNetmapWorkers(), RunModeIdsNflogAutoFp(), RunModeIdsNflogRegister(), RunModeIdsNflogSingle(), RunModeIdsNflogWorkers(), RunModeIdsPcapAutoFp(), RunModeIdsPcapRegister(), RunModeIdsPcapSingle(), RunModeIdsPcapWorkers(), RunModeIdsPfringAutoFp(), RunModeIdsPfringRegister(), RunModeIdsPfringSingle(), RunModeIdsPfringWorkers(), RunModeNapatechRegister(), RunModeRegisterNewRunMode(), RunModeSetIPSAutoFp(), RunModeSetIPSWorker(), RunModeSetLiveCaptureAutoFp(), RunModeSetLiveCaptureSingle(), RunModeSetLiveCaptureWorkers(), RunModeShutDown(), RunModeUnixSocketGetDefaultMode(), RunUnittests(), SCACBSPreparePatterns(), SCACPreparePatterns(), SCACTilePreparePatterns(), SCAsn1CtxNew(), SCClassConfAllocClasstype(), SCClassConfDeinit(), SCClassConfDeInitContext(), SCClassConfLoadClassficationConfigFile(), SCConfLogOpenGeneric(), SCGetGroupID(), SCGetUserID(), SCHInfoAddHostOSInfo(), SCHInfoGetHostOSFlavour(), SCHInfoLoadFromConfig(), SCKernelVersionIsAtLeast(), SCLogAddToFGFFileList(), SCLogAddToFGFFuncList(), SCLogAddToFGFLineList(), SCLogAllocLogOPBuffer(), SCLogInitLogModule(), SCLogLoadConfig(), SCLogMessage(), SCPidfileCreate(), SCPidfileTestRunning(), SCProfilingDumpPacketStats(), SCProfilingInit(), SCProfilingKeywordsGlobalInit(), SCProfilingKeywordUpdateCounter(), SCProfilingPrefilterGlobalInit(), SCProfilingPrefilterUpdateCounter(), SCProfilingRulesGlobalInit(), SCProfilingRuleUpdateCounter(), SCProfilingSghsGlobalInit(), SCProfilingSghUpdateCounter(), SCProtoNameInit(), SCRadixAddKeyIPV6String(), SCRadixCreateRadixTree(), SCRadixReleaseRadixTree(), SCRConfAllocSCRConfReference(), SCRConfDeInitContext(), SCRConfLoadReferenceConfigFile(), SCReferenceConfDeinit(), SCRuleVarsGetConfVar(), SCThresholdConfInitContext(), SetupFPAnalyzer(), SetupRuleAnalyzer(), SigGroupBuild(), SigMatchList2DataArray(), SigMatchListSMBelongsTo(), SigStringAlloc(), SinglePatternMatchDefaultMatcher(), SMTPProcessDataChunk(), SMTPStateAlloc(), SRepCatGetByShortname(), SRepInit(), SRepLoadCatFileFromFD(), SRepLoadFileFromFD(), SRepResetVersion(), SSLVersionToString(), StatsInit(), StatsSetUI64(), StatsSpawnThreads(), StorageRegister(), StreamTcpAppLayerIsDisabled(), StreamTcpInitConfig(), StreamTcpReassembleInitThreadCtx(), StreamTcpThreadInit(), TagInitCtx(), TAILQ_HEAD(), ThresholdHashInit(), ThresholdInit(), ThresholdIPPairTimeoutCheck(), TLSGetIPInformations(), TmModuleDecodeNetmapRegister(), TmModuleDecodePcapRegister(), TmModuleGetById(), TmqCreateQueue(), TmqhFlowRegister(), TmThreadCreate(), TmThreadGetNbThreads(), TmThreadInitMC(), TmThreadSetCPU(), TmThreadSetGroupName(), TmThreadSetPrio(), TmThreadsSlotVarRun(), TmThreadWaitOnThreadInit(), TmValidateQueueState(), Unified2AlertInitCtx(), Unified2AlertRegister(), UnixManagerThreadSpawn(), UnixSocketPcapFile(), UTHAppendSigs(), UTHBuildPacketArrayFromEth(), UTHCheckPacketMatchResults(), UTHGenericTest(), UTHMatchPackets(), UTHMatchPacketsWithResults(), UtilCpuGetNumProcessorsConfigured(), UtilCpuGetNumProcessorsMax(), UtilCpuGetNumProcessorsOnline(), ValidateIPV4Address(), ValidateIPV6Address(), and ValidateLinkType(). Definition at line 297 of file util-debug.h. Definition at line 254 of file util-debug.h. Referenced by AffinitySetupLoadFromConfig(), AFPGetLinkType(), AFPIsFanoutSupported(), AFPPeersListCheck(), AFPRunModeIsIPS(), AFPSetBPFFilter(), AppLayerParserRegisterProtocolParsers(), ChecksumAutoModeCheck(), CleanupRuleAnalyzer(), ConfUnixSocketIsEnable(), CoredumpLoadConfig(), DecodeIPFW(), DetectAddressLookupInHead(), DetectAddressPrintList(), DetectEngineInspectBufferGeneric(), DetectEngineMTApply(), DetectEngineMultiTenantSetup(), DetectEngineResetMaxSigId(), DetectEngineTentantRegisterPcapFile(), DetectEngineTentantUnregisterPcapFile(), DetectFastPatternRegister(), DetectFilemagicRegister(), DetectHostbitFree(), DetectLoadersInit(), DetectLuaRegister(), DetectPcreRegister(), FileForceHashParseCfg(), GetIfaceMTU(), GetIfaceRSSQueuesNum(), GlobalsInitPreConfig(), HTPParseMemcap(), InitPcapFile(), IPFWSetVerdict(), LiveGetDeviceName(), LogTcpDataLogInitCtx(), main(), MimeDecParseFullMsg(), MpmTableSetup(), NapatechDeleteFilter(), NapatechGetStreamConfig(), NapatechPacketLoopZC(), NapatechSetupNuma(), NapatechSetupTraffic(), NapatechStreamThreadExitStats(), NFQInitConfig(), NoWinDivertSupportExit(), OutputJsonRegister(), OutputRegisterFiledataLogger(), PacketCreateMask(), PcapDetermineDirectoryOrFile(), PcapDirectoryDispatch(), PcapFileDispatch(), PcapFileGlobalInit(), PcapLogProfileSetup(), PostRunDeinit(), ReceiveErfDagLoop(), ReceiveErfDagThreadExitStats(), ReceiveErfDagThreadInit(), ReceiveErfFileLoop(), ReceiveErfFileThreadExitStats(), ReceiveErfFileThreadInit(), ReceiveIPFWLoop(), ReceivePcapThreadExitStats(), ReceivePcapThreadInit(), ReceivePfringThreadInit(), RegisterAllModules(), RegisterDCERPCParsers(), RegisterDCERPCUDPParsers(), RegisterENIPUDPParsers(), RegisterFTPParsers(), RegisterHTPParsers(), RegisterSMBParsers(), RegisterSMTPParsers(), RegisterSSLParsers(), RunModeErfFileAutoFp(), RunModeErfFileSingle(), RunModeIdsAFPRegister(), RunModeIdsErfDagAutoFp(), RunModeIdsErfDagSingle(), RunModeIdsErfDagWorkers(), RunModeIdsNetmapRegister(), RunModeIdsNflogAutoFp(), RunModeIdsNflogRegister(), RunModeIdsNflogSingle(), RunModeIdsNflogWorkers(), RunModeIdsPcapAutoFp(), RunModeIdsPcapRegister(), RunModeIdsPcapSingle(), RunModeIdsPcapWorkers(), RunModeIdsPfringAutoFp(), RunModeIdsPfringRegister(), RunModeIdsPfringSingle(), RunModeIdsPfringWorkers(), RunModeInitializeOutputs(), RunModeNapatechRegister(), RunModeSetLiveCaptureAutoFp(), RunModeUnixSocketGetDefaultMode(), RunUnittests(), SCClassConfDeInitContext(), SCConfLogOpenGeneric(), SCLogDeInitLogModule(), SCProfilingInit(), SCRConfDeInitContext(), SCThresholdConfInitContext(), SCThresholdConfParseFile(), SetupFPAnalyzer(), SetupRuleAnalyzer(), SigAddressCleanupStage1(), SigAddressPrepareStage1(), SigInit(), SigLoadSignatures(), SinglePatternMatchDefaultMatcher(), SRepInit(), StatsSetUI64(), StreamTcpCheckStreamContents(), StreamTcpReassembleFree(), TLSGetIPInformations(), TmModuleDecodeAFPRegister(), TmModuleDecodeIPFWRegister(), TmModuleDecodePcapRegister(), TmThreadsListThreads(), Unified2AlertInitCtx(), UnixSocketPcapFile(), UTHCheckPacketMatchResults(), UtilCpuPrintSummary(), UtRunTests(), and VerdictIPFWThreadExitStats(). Definition at line 256 of file util-debug.h. Definition at line 269 of file util-debug.h. Referenced by DetectEngineMultiTenantSetup(), DetectEngineReload(), DetectTemplateBufferRegister(), DetectTemplateRustBufferRegister(), LiveDeviceListClean(), main(), NoNFLOGSupportExit(), OutputRegisterTxLogger(), PcapFileGlobalInit(), PostRunDeinit(), ReceiveIPFWThreadExitStats(), ReceiveNFQThreadExitStats(), RegisterAllModules(), RegisterNFSUDPParsers(), RegisterTemplateParsers(), RegisterTemplateRustParsers(), RunModeFilePcapSingle(), RunModeIdsAFPRegister(), TmModuleDecodeNetmapRegister(), TmqhFlowRegister(), TmThreadsSlotVarRun(), and TmThreadWaitOnThreadInit(). Definition at line 271 of file util-debug.h. Definition at line 261 of file util-debug.h. Referenced by AFPGetLinkType(), AFPIsFanoutSupported(), AppLayerHtpPrintStats(), DetectMpmPrepareAppMpms(), DetectMpmSetupAppMpms(), GetIfaceMaxPacketSize(), HostPrintStats(), IPPairPrintStats(), MpmStoreReportStats(), PacketCreateMask(), ReceiveAFPThreadExitStats(), ReceivePfringThreadExitStats(), ReceivePfringThreadInit(), RunModeIdsAFPRegister(), RunModeIdsNetmapRegister(), RunModeIdsPfringRegister(), SCProfilingDump(), SCProfilingKeywordInitCounters(), SCProfilingKeywordsGlobalInit(), SCProfilingPrefilterGlobalInit(), SCProfilingPrefilterInitCounters(), SCProfilingRuleInitCounters(), SCProfilingRulesGlobalInit(), SCProfilingSghInitCounters(), SCProfilingSghsGlobalInit(), SigAddressPrepareStage4(), TmModuleDecodeNetmapRegister(), TmqhOutputFlowFreeCtx(), and TmThreadSetupOptions(). Definition at line 281 of file util-debug.h. Referenced by AFPGetLinkType(), AFPIsFanoutSupported(), AppLayerParserRegisterMpmIDsFuncs(), CleanupPcapFileFileVars(), DefragRbFragCompare(), DefragTrackerFreeFrags(), DetectEngineAppendSig(), DetectEngineContentInspection(), DetectEngineCtxFree(), DetectEngineMultiTenantSetup(), DetectEngineReloadTenantBlocking(), DetectEngineThreadCtxDeinit(), DetectFilemagicRegister(), DetectFlowbitsAnalyze(), DetectHttpHHRegister(), DetectLoadCompleteSigPath(), DetectPcrePayloadMatch(), DetectReplaceRegister(), DetectTagRegister(), DetectTlsFingerprintRegister(), DetectTlsJa3HashRegister(), DetectTlsSerialRegister(), EngineAnalysisRulesFailure(), FileForceHashParseCfg(), GetIfaceMaxPacketSize(), GetIfaceMTU(), GetIfaceRSSQueuesNum(), HashTableAdd(), HashTableLookup(), HTPFreeConfig(), HttpXFFGetCfg(), IPFWSetVerdict(), Ja3IsDisabled(), LiveGetDevice(), LogCustomFormatAddNode(), MemBufferCreateNew(), MemBufferExpand(), MimeDecSetConfig(), MpmAddPattern(), MpmRegisterTests(), NapatechStreamThreadInit(), NFQGetThread(), NFQInitConfig(), NFQRegisterQueue(), NFQSetVerdict(), NoNFLOGSupportExit(), NoWinDivertSupportExit(), OutputJsonRegister(), PacketCreateMask(), PcapDetermineDirectoryOrFile(), PcapFileGlobalInit(), PostRunDeinit(), ReceiveAFPLoop(), ReceiveAFPThreadInit(), ReceiveIPFWLoop(), ReceiveIPFWThreadDeinit(), ReceivePfringThreadInit(), RegisterAllModules(), RegisterSMBParsers(), RegisterSSLParsers(), RunModeDispatch(), RunModeIdsAFPRegister(), RunModeIdsNetmapRegister(), RunModeIdsNflogRegister(), RunModeIdsPcapRegister(), RunModeIdsPfringRegister(), RunModeInitializeOutputs(), RunModeSetIPSAutoFp(), RunModeSetLiveCaptureAutoFp(), RunModeShutDown(), SCConfLogReopen(), SCLogLoadConfig(), SCProfilingInit(), SCProfilingRulesGlobalInit(), SCProfilingSghsGlobalInit(), SCThresholdConfInitContext(), SigLoadSignatures(), SigTableRegisterTests(), SRepResetVersion(), StatsSetUI64(), StreamSegmentForEach(), StreamTcpInitConfig(), TmModuleDecodeAFPRegister(), TmModuleDecodePfringRegister(), TmModuleRegisterTests(), TmThreadRemove(), and TmThreadsSlotVarRun(). Definition at line 284 of file util-debug.h. Definition at line 339 of file util-debug.h. Referenced by AppLayerDestroyCtxThread(), AppLayerHtpEnableRequestBodyCallback(), AppLayerHtpEnableResponseBodyCallback(), AppLayerHtpNeedFileInspection(), AppLayerListSupportedProtocols(), AppLayerParserBackupParserTable(), AppLayerParserDestroyProtocolParserLocalStorage(), AppLayerParserRegisterDetectFlagsFuncs(), AppLayerParserRegisterDetectStateFuncs(), AppLayerParserRegisterGetEventInfo(), AppLayerParserRegisterGetEventsFunc(), AppLayerParserRegisterGetFilesFunc(), AppLayerParserRegisterGetStateProgressCompletionStatus(), AppLayerParserRegisterGetStateProgressFunc(), AppLayerParserRegisterGetTx(), AppLayerParserRegisterGetTxCnt(), AppLayerParserRegisterGetTxIterator(), AppLayerParserRegisterLocalStorageFunc(), AppLayerParserRegisterLogger(), AppLayerParserRegisterLoggerBits(), AppLayerParserRegisterLoggerFuncs(), AppLayerParserRegisterMpmIDsFuncs(), AppLayerParserRegisterOptionFlags(), AppLayerParserRegisterParserAcceptableDataDirection(), AppLayerParserRegisterProtocolUnittests(), AppLayerParserRegisterStateFuncs(), AppLayerParserRegisterTruncateFunc(), AppLayerParserRegisterTxFreeFunc(), AppLayerParserRegisterUnittests(), AppLayerParserRestoreParserTable(), AppLayerParserSetEOF(), AppLayerParserSetStreamDepth(), AppLayerParserSetTransactionInspectId(), AppLayerParserSetTransactionLogId(), AppLayerParserSetTxDetectFlags(), AppLayerParserSetTxLogged(), AppLayerParserStateCleanup(), AppLayerParserStateFree(), AppLayerParserStateSetFlag(), AppLayerParserStreamTruncated(), AppLayerParserThreadCtxFree(), AppLayerParserTransactionsCleanup(), AppLayerParserTriggerRawStreamReassembly(), AppLayerProtoDetectDestroyCtxThread(), AppLayerProtoDetectGetProto(), AppLayerProtoDetectPPRegister(), AppLayerProtoDetectRegisterProtocol(), AppLayerProtoDetectSupportedAppProtocols(), AppLayerProtoDetectSupportedIpprotos(), AppLayerProtoDetectUnittestCtxBackup(), AppLayerProtoDetectUnittestCtxRestore(), AppLayerProtoDetectUnittestsRegister(), AppLayerUnittestsRegister(), BoyerMooreCtxDeInit(), CleanupPcapFileFileVars(), DecodeIPV6FragHeader(), DefragPolicyLoadFromConfig(), DetectCipServiceRegister(), DetectContentFree(), DetectDsizeRegister(), DetectFlagsSignatureNeedsSynOnlyPackets(), DetectFlowvarRegister(), DetectICodeFree(), DetectITypeFree(), DetectMetadataFree(), DetectReferenceFree(), DetectRpcFree(), DetectTemplate2Free(), DetectTtlFree(), DetectUricontentRegister(), EngineAnalysisRulesFailure(), FileDisableFilesize(), FileDisableMagic(), FileDisableMd5(), FileDisableSha1(), FileDisableSha256(), FileDisableStoring(), FileDisableStoringForTransaction(), FlowInit(), HTPAtExitPrintStats(), HtpBodyPrune(), HTPConfigure(), HTPFreeConfig(), HTPStateFree(), IPOnlyCIDRListFree(), NoWinDivertSupportExit(), OutputRegisterFiledataLogger(), PoolReturn(), Prefilter(), PrefilterPktStreamRegister(), ReceiveIPFWThreadExitStats(), RegisterDNP3Parsers(), RegisterENIPTCPParsers(), RegisterENIPUDPParsers(), RegisterHTPParsers(), RegisterModbusParsers(), SCACBSInitCtx(), SCACInitCtx(), SigAlloc(), SigGroupHeadPrintSigs(), SigMatchSignaturesGetSgh(), StatsSetUI64(), StatsSpawnThreads(), StreamTcpInlineSegmentReplacePacket(), StreamTcpPruneSession(), StreamTcpPseudoPacketCreateStreamEndPacket(), StreamTcpReassembleFreeThreadCtx(), StreamTcpSackFreeList(), StreamTcpSackPruneList(), StreamTcpSessionCleanup(), StreamTcpSessionClear(), StreamTcpSessionPktFree(), TagHandlePacket(), TmModuleDecodePcapRegister(), TmqhOutputPacketpool(), and TmThreadSetPrio(). Definition at line 347 of file util-debug.h. Definition at line 349 of file util-debug.h. Definition at line 351 of file util-debug.h. Referenced by AppLayerGetProtoByName(), AppLayerGetProtoName(), AppLayerParserGetFirstDataDir(), AppLayerParserGetTransactionActive(), AppLayerParserGetTransactionInspectId(), AppLayerParserGetTransactionLogId(), AppLayerParserGetTxCnt(), AppLayerProtoDetectGetProtoByName(), and NoWinDivertSupportExit(). Definition at line 345 of file util-debug.h. Definition at line 341 of file util-debug.h. Referenced by AFPPeersListCheck(), AFPPeersListInit(), AppLayerDeSetup(), AppLayerHandleTCPData(), AppLayerHandleUdp(), AppLayerParserConfParserEnabled(), AppLayerParserDeSetup(), AppLayerParserGetEventInfo(), AppLayerParserGetStateProgress(), AppLayerParserGetStateProgressCompletionStatus(), AppLayerParserGetStreamDepth(), AppLayerParserParse(), AppLayerParserProtocolHasLogger(), AppLayerParserProtocolIsTxAware(), AppLayerParserProtocolIsTxEventAware(), AppLayerParserProtocolSupportsTxs(), AppLayerParserRegisterParser(), AppLayerParserSetTxDetectState(), AppLayerParserSetup(), AppLayerParserStateIssetFlag(), AppLayerProtoDetectConfProtoDetectionEnabled(), AppLayerProtoDetectDeSetup(), AppLayerProtoDetectPMRegisterPatternCI(), AppLayerProtoDetectPMRegisterPatternCS(), AppLayerProtoDetectPMRegisterPatternCSwPP(), AppLayerProtoDetectPPParseConfPorts(), AppLayerProtoDetectPrepareState(), AppLayerProtoDetectSetup(), AppLayerSetup(), CleanupPcapFileDirectoryVars(), ConfigCheckLogDirectory(), DCERPCParser(), DecodeAFP(), DecodeAFPThreadDeinit(), DecodeAFPThreadInit(), DecodeErfDag(), DecodeErfDagThreadDeinit(), DecodeErfDagThreadInit(), DecodeErfFile(), DecodeErfFileThreadDeinit(), DecodeErfFileThreadInit(), DecodeIPFW(), DecodeIPFWThreadDeinit(), DecodeIPFWThreadInit(), DecodeNFQThreadDeinit(), DecodeNFQThreadInit(), DecodePcap(), DecodePcapThreadDeinit(), DecodePcapThreadInit(), DecodePfringThreadDeinit(), DecodePfringThreadInit(), DetectAddressMatch(), DetectAddressMatchIPv4(), DetectAddressMatchIPv6(), DetectBytejumpDoMatch(), DetectBytetestDoMatch(), DetectCipServiceRegister(), DetectDceIfaceRegister(), DetectDceOpnumRegister(), DetectDetectionFilterRegister(), DetectDsizeRegister(), DetectEngineContentInspection(), DetectEngineEventRegister(), DetectEngineInspectCIP(), DetectEngineInspectENIP(), DetectEngineInspectModbus(), DetectEngineInspectPacketPayload(), DetectEnipCommandRegister(), DetectFileextRegister(), DetectFileInspectGeneric(), DetectFilemagicRegister(), DetectFilenameRegister(), DetectFilesizeRegister(), DetectFilestoreRegister(), DetectFlagsRegister(), DetectFlowMatch(), DetectFtpbounceRegister(), DetectHttpRawHeaderRegister(), DetectLuaRegister(), DetectNfsProcedureRegister(), DetectNfsVersionRegister(), DetectNocaseRegister(), DetectPcrePayloadMatch(), DetectPrefilterRegister(), DetectRawbytesRegister(), DetectReferenceFree(), DetectSignatureAddTransform(), DetectSshSoftwareVersionRegister(), DetectSshVersionRegister(), DetectSslVersionRegister(), DetectStreamSizeRegister(), DetectThresholdRegister(), DetectTlsRegister(), DetectTlsValidityRegister(), DetectTlsVersionRegister(), DetectTransformCompressWhitespaceRegister(), DetectTransformMd5Register(), DetectTransformSha1Register(), DetectTransformSha256Register(), DetectTransformStripWhitespaceRegister(), DetectUricontentRegister(), DetectUrilenRegister(), FileAppendData(), FileAppendDataById(), FileAppendGAPById(), FileCloseFile(), FileCloseFileById(), FileCloseFilePtr(), FileContainerSetTx(), FileSetRange(), FileSetTx(), FileStore(), FileTrackedSize(), FlowClearMemory(), FlowForceReassemblyNeedReassembly(), HtpBodyAppendChunk(), HTPFileClose(), HTPFileOpen(), HTPFileSetRange(), HTPFileStoreChunk(), HTPFreeConfig(), InitPcapFile(), IPFWSetVerdict(), JsonDNSLogAnswer(), LiveDeviceListClean(), LogFileFreeCtx(), LogHttpLogger(), LogTcpDataLogger(), NapatechDecode(), NapatechDecodeThreadDeinit(), NapatechDecodeThreadInit(), NapatechPacketLoopZC(), NapatechStreamThreadDeinit(), NapatechStreamThreadInit(), NoNFLOGSupportExit(), NoWinDivertSupportExit(), OutputRegisterFiledataLogger(), OutputRegisterFileLogger(), PacketAlertGetTag(), PacketAlertThreshold(), PacketCreateMask(), PcapDetermineDirectoryOrFile(), PcapDirectoryDispatch(), PcapFileDispatch(), PcapFileGlobalInit(), PmqSetup(), PostRunDeinit(), printUUID(), ReceiveAFPLoop(), ReceiveAFPThreadDeinit(), ReceiveAFPThreadInit(), ReceiveErfDagLoop(), ReceiveErfDagThreadDeinit(), ReceiveErfDagThreadInit(), ReceiveErfFileLoop(), ReceiveErfFileThreadInit(), ReceiveIPFWLoop(), ReceiveIPFWThreadDeinit(), ReceiveIPFWThreadInit(), ReceiveNFQLoop(), ReceivePcapBreakLoop(), ReceivePcapLoop(), ReceivePcapThreadDeinit(), ReceivePcapThreadInit(), ReceivePfringLoop(), ReceivePfringThreadInit(), RegisterAllModules(), RejectSendIPv4ICMP(), RejectSendIPv4TCP(), RejectSendIPv6ICMP(), RejectSendIPv6TCP(), RunModeErfFileAutoFp(), RunModeErfFileSingle(), RunModeIdsAFPAutoFp(), RunModeIdsAFPSingle(), RunModeIdsAFPWorkers(), RunModeIdsErfDagAutoFp(), RunModeIdsErfDagSingle(), RunModeIdsErfDagWorkers(), RunModeIdsNetmapAutoFp(), RunModeIdsNetmapSingle(), RunModeIdsNetmapWorkers(), RunModeIdsNflogAutoFp(), RunModeIdsNflogSingle(), RunModeIdsNflogWorkers(), RunModeIdsPcapAutoFp(), RunModeIdsPcapSingle(), RunModeIdsPcapWorkers(), SBBCompare(), SCPidfileCreate(), SigAddressPrepareStage4(), SigGroupHeadContainsSigId(), SigLoadSignatures(), SigMatchList2DataArray(), SigMatchListSMBelongsTo(), SignatureHasPacketContent(), SignatureHasStreamContent(), SignatureIsIPOnly(), SigParseGetMaxDsize(), SMTPProcessDataChunk(), SSLVersionToString(), StreamNeedsReassembly(), StreamReassembleLog(), StreamTcpCheckStreamContents(), StreamTcpInlineSegmentCompare(), StreamTcpPacket(), StreamTcpReassembleAppLayer(), StreamTcpReassembleHandleSegment(), StreamTcpReassembleHandleSegmentHandleData(), StreamTcpReassembleInsertSegment(), StreamTcpSackUpdatePacket(), StreamTcpThreadDeinit(), StreamTcpThreadInit(), TagHashAddTag(), TcpSackCompare(), TcpSegmentCompare(), TmModuleDecodeAFPRegister(), TmModuleDecodeNetmapRegister(), UnixSocketPcapFile(), UTHPacketMatchSigMpm(), ValidateLinkType(), VerdictIPFW(), VerdictIPFWThreadDeinit(), and VerdictIPFWThreadInit(). Definition at line 353 of file util-debug.h. Referenced by AppLayerGetCtxThread(), AppLayerHtpPrintStats(), AppLayerParserGetDecoderEvents(), AppLayerParserGetEventsByTx(), AppLayerParserGetFiles(), AppLayerParserGetProtocolParserLocalStorage(), AppLayerParserGetTx(), AppLayerParserGetTxDetectState(), AppLayerParserStateAlloc(), AppLayerParserThreadCtxAlloc(), AppLayerProtoDetectGetCtxThread(), BasicSearch(), DCERPCInit(), DetectAddressLookupInHead(), DetectCipServiceRegister(), DetectFilenameRegister(), DetectFlagsRegister(), DetectHttpClientBodyRegister(), DetectPortHashLookup(), DetectReferenceFree(), FileOpenFile(), PacketDefragPktSetup(), PacketTunnelPktSetup(), PoolGet(), ROHashLookup(), SigGroupHeadHashLookup(), SigInit(), SigMatchSignaturesGetSgh(), SMTPStateAlloc(), StreamTcpPseudoSetup(), StreamTcpReassembleInitThreadCtx(), and ThresholdIPPairTimeoutCheck(). Definition at line 343 of file util-debug.h. Referenced by AppLayerParserGetTxDetectFlags(), AppLayerParserGetTxLogged(), AppLayerParserProtocolGetLoggerBits(), AppLayerProtoDetectGetProto(), printUUID(), and StreamTcpReassembleDepthReached(). 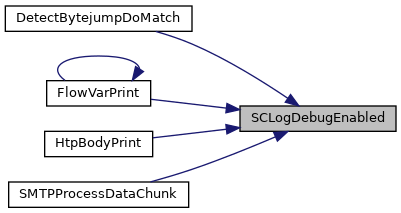 Structure to be used when log_level override support would be provided by the logging module. The various log levels NOTE: when adding new level, don't forget to update SCLogMapLogLevelToSyslogLevel() or it may result in logging to syslog with LOG_EMERG priority. Definition at line 51 of file util-debug.h. The various output interfaces supported. Definition at line 70 of file util-debug.h. Definition at line 77 of file util-debug.h. Returns a pointer to a new SCLogInitData. This is a public interface intended to be used after the logging paramters are read from the conf file. Definition at line 1111 of file util-debug.c. References SCLogConfig_::log_format, SCLogConfig_::op_filter, SCLogConfig_::op_filter_regex, SCLogConfig_::op_filter_regex_study, SCLogInitData_::op_ifaces, SCLogConfig_::op_ifaces, pcre_free_study, SCFree, SCMalloc, and SCLogConfig_::startup_message. Referenced by SCLogDeInitLogModule(), and SCLogLoadConfig(). Allocates an output buffer for an output interface. Used when we want the op_interface log_format to override the global_log_format. Currently not used. Definition at line 650 of file util-debug.c. References closelog, SCLogOPIfaceCtx_::facility, SCLogOPIfaceCtx_::file, SCLogOPIfaceCtx_::file_d, SCLogOPIfaceCtx_::fp_mutex, SCLogInitData_::global_log_format, SCLogInitData_::global_log_level, SCLogOPIfaceCtx_::iface, SCLogOPBuffer_::log_format, SCLogOPIfaceCtx_::log_format, SCLogConfig_::log_format, SCLogOPIfaceCtx_::log_level, SCLogConfig_::log_level, SCLogOPBuffer_::msg, SCLogOPIfaceCtx_::next, SCLogInitData_::op_filter, SCLogConfig_::op_filter, SCLogConfig_::op_filter_regex, SCLogConfig_::op_filter_regex_study, SCLogInitData_::op_ifaces, SCLogConfig_::op_ifaces, SCLogInitData_::op_ifaces_cnt, SCLogConfig_::op_ifaces_cnt, openlog, OutputRegisterFileRotationFlag(), SCLogOPIfaceCtx_::rotation_flag, SC_ERR_FATAL, SC_LOG_DEF_LOG_FILE, SC_LOG_DEF_LOG_FORMAT, SC_LOG_DEF_LOG_LEVEL, SC_LOG_DEF_LOG_OP_IFACE, SC_LOG_DEF_SYSLOG_FACILITY, SC_LOG_DEF_SYSLOG_FACILITY_STR, SC_LOG_ENV_LOG_FACILITY, SC_LOG_ENV_LOG_FILE, SC_LOG_ENV_LOG_FORMAT, SC_LOG_ENV_LOG_LEVEL, SC_LOG_ENV_LOG_OP_FILTER, SC_LOG_ENV_LOG_OP_IFACE, sc_log_global_log_level, SC_LOG_LEVEL_MAX, SC_LOG_MAX_LOG_FORMAT_LEN, SC_LOG_NOTSET, SC_LOG_OP_IFACE_CONSOLE, SC_LOG_OP_IFACE_FILE, SC_LOG_OP_IFACE_MAX, SC_LOG_OP_IFACE_SYSLOG, SCFree, SCLogError, SCMalloc, SCMapEnumNameToValue(), SCMapEnumValueToName(), SCMutexDestroy, SCMutexInit, SCStrdup, SCSyslogGetFacilityMap(), str, SCLogOPBuffer_::temp, TRUE, SCLogOPIfaceCtx_::type, type, and SCLogOPIfaceCtx_::use_color. Appends an output_interface to the output_interface list sent in head. Definition at line 1174 of file util-debug.c. References head, SCLogOPIfaceCtx_::next, SCLogInitData_::op_ifaces, and SCLogInitData_::op_ifaces_cnt. Definition at line 631 of file util-debug.c. Referenced by AppLayerProtoDetectPrepareState(), DecodeIPV4(), DecodeIPV6(), DetectBytejumpDoMatch(), DetectFileextRegister(), DetectFilemagicRegister(), DetectFilenameRegister(), DetectMsgRegister(), DetectPortInsert(), FlowVarPrint(), HtpBodyPrint(), printUUID(), SigAddressPrepareStage1(), SMTPProcessDataChunk(), SRepLoadFileFromFD(), and StreamTcpReassembleInsertSegment(). Definition at line 1477 of file util-debug.c. References FAIL_IF_NOT, FAIL_IF_NULL, SCLogInitData_::global_log_format, SCLogInitData_::global_log_level, SCLogOPIfaceCtx_::iface, SCLogOPIfaceCtx_::log_format, SCLogConfig_::log_format, SCLogConfig_::log_level, SCLogOPIfaceCtx_::next, SCLogInitData_::op_filter, SCLogConfig_::op_ifaces, PASS, SC_LOG_ALERT, SC_LOG_DEBUG, SC_LOG_DEF_LOG_FORMAT, SC_LOG_DEF_LOG_LEVEL, SC_LOG_DEF_LOG_OP_IFACE, SC_LOG_ENV_LOG_FORMAT, SC_LOG_ENV_LOG_LEVEL, SC_LOG_ENV_LOG_OP_IFACE, SC_LOG_ERROR, sc_log_global_log_level, sc_log_module_cleaned, sc_log_module_initialized, SC_LOG_OP_IFACE_CONSOLE, SC_LOG_OP_IFACE_FILE, SCFree, SCLogAddFDFilter(), SCLogAddFGFilterBL(), SCLogAllocLogInitData(), SCLogAppendOPIfaceCtx(), SCLogDeInitLogModule(), SCLogInfo, SCLogInitLogModule(), SCLogInitOPIfaceCtx(), SCLogPrintFDFilters(), SCLogPrintFGFilters(), SCLogReleaseFDFilters(), SCLogReleaseFGFilters(), SCLogRemoveFDFilter(), SCMutexDestroy, setenv(), SCLogInitData_::startup_message, str, and unsetenv(). Referenced by GlobalsInitPreConfig(), SCLogDeInitLogModule(), and SCLogInitLogModule(). sc_lid The initialization data for the logging module. If sc_lid is NULL, we would stick to the default configuration for the logging subsystem. Definition at line 1259 of file util-debug.c. References SC_ERR_FATAL, SC_ERR_MUTEX, sc_log_global_log_level, sc_log_module_cleaned, sc_log_module_initialized, SCLogDeInitLogModule(), SCLogError, SCMalloc, and SCMutexInit. Referenced by main(), SCLogDeInitLogModule(), and SCLogLoadConfig(). Creates a new output interface based on the arguments sent. The kind of output interface to be created is decided by the iface_name arg. If iface_name is "file", the arg argument will hold the filename to be used for logging purposes. If iface_name is "syslog", the arg argument holds the facility code. If iface_name is "console", arg is NULL. iface_name Interface name. Can be "console", "file" or "syslog"
Definition at line 1219 of file util-debug.c. References SC_LOG_DEBUG, SC_LOG_NOTSET, SC_LOG_OP_IFACE_CONSOLE, SC_LOG_OP_IFACE_FILE, SC_LOG_OP_IFACE_SYSLOG, SC_LOG_OP_TYPE_REGULAR, SCMapEnumNameToValue(), and SCSyslogGetFacilityMap(). Definition at line 1296 of file util-debug.c. References ConfGet(), ConfGetNode(), ConfigGetLogDirectory(), ConfNodeLookupChild(), ConfNodeLookupChildValue(), ConfValIsFalse(), FatalError, SCLogInitData_::global_log_format, SCLogInitData_::global_log_level, SCLogConfig_::log_format, ConfNode_::name, next, SCLogInitData_::op_filter, SCLogConfig_::op_filter, PathIsAbsolute(), SC_ERR_FATAL, SC_ERR_INVALID_ARGUMENT, SC_ERR_MISSING_CONFIG_PARAM, SC_LOG_DEF_LOG_FORMAT, SC_LOG_DEF_SYSLOG_FACILITY, SC_LOG_DEF_SYSLOG_FACILITY_STR, sc_log_global_log_level, SC_LOG_LEVEL_MAX, SC_LOG_NOTICE, SC_LOG_OP_TYPE_JSON, SC_LOG_OP_TYPE_REGULAR, SCFree, SCLogAllocLogInitData(), SCLogAppendOPIfaceCtx(), SCLogDebug, SCLogError, SCLogInitLogModule(), SCLogWarning, SCMalloc, SCMapEnumNameToValue(), SCStrdup, SCSyslogGetFacilityMap(), TAILQ_FOREACH, type, unlikely, and ConfNode_::val. Referenced by ListAppLayerProtocols(), ListKeywords(), and main(). Definition at line 548 of file util-debug.c. References SCLogOPIfaceCtx_::file, SCLogOPIfaceCtx_::file_d, SCLogOPIfaceCtx_::fp_mutex, SCLogOPIfaceCtx_::iface, SCLogOPIfaceCtx_::log_format, SCLogConfig_::log_format, SCLogOPIfaceCtx_::log_level, SCLogOPIfaceCtx_::next, SCLogConfig_::op_ifaces, SCLogOPIfaceCtx_::rotation_flag, SC_ERR_FOPEN, SC_LOG_ERROR, SC_LOG_MAX_LOG_MSG_LEN, sc_log_module_initialized, SC_LOG_NOTSET, SC_LOG_OP_IFACE_CONSOLE, SC_LOG_OP_IFACE_FILE, SC_LOG_OP_IFACE_SYSLOG, SC_OK, SCLogError, SCMutexLock, SCMutexUnlock, SCLogOPIfaceCtx_::type, and SCLogOPIfaceCtx_::use_color. Definition at line 1680 of file util-debug.c. Definition at line 97 of file util-debug.c. Referenced by SCLogAllocLogOPBuffer(), SCLogDebugEnabled(), SCLogDeInitLogModule(), SCLogInitLogModule(), and SCLogLoadConfig(). Referenced by SCLogDeInitLogModule(), and SCLogInitLogModule(). Referenced by SCLogDeInitLogModule(), SCLogInitLogModule(), and SCLogMessage().